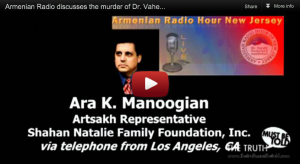 Armenian Radio Hour of New Jersey discusses the murder of Dr. Vahe Avetyan and Member of Armenian Parliament Ruben Hayrapetyan, a.k.a. Nemets Rubo, on July 8, 2012, in New Jersey, NJ. The hosts of the radio show are Khoren Bezirdjian and Diran Jebejian. 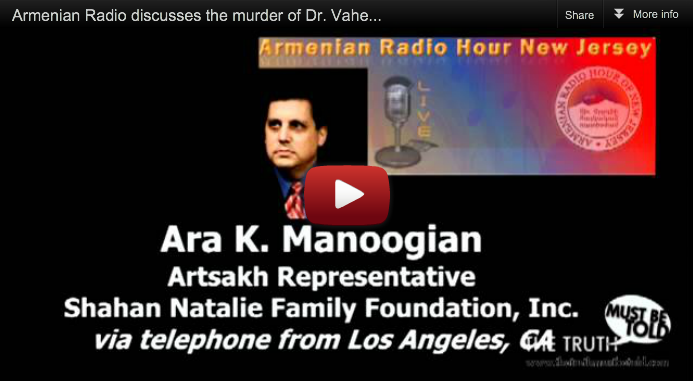 Ara K. Manoogian, a human rights activist, an investigative journalist, Artsakh Representative of the Shahan Natalie Family Foundation, Inc.
Raffi Krikorian, Ara Araz shared the opinion about the show and telephone interviews with Ara K. Manoogian and Garo Ghazaryan. Near the end of the radio show, attached is a video of a protest in front of Harsnakar restaurant, which shows the police crackdown on the peaceful protestors, as well as Garegin Choogaszyan reading out a list of demands to Ruben Hayrapetyan, a.k.a. Nemets Rubo.